Speakers thanked all veterans during an early observance of the day. 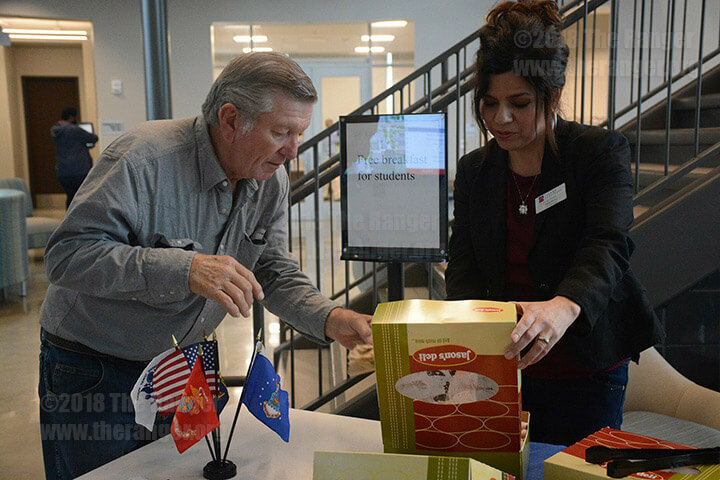 More than 100 individuals, including veterans, students, faculty and staff of this college gathered Nov. 8 at the Victory Center for a ceremony to honor veterans of the U.S. Armed Forces. Tammy Micallef, director of the Victory Center, welcomed everyone and introduced the 223D Army Band “Fort Sam’s Own” which performed the national anthem. The Rev. Barry Kowald, who also is a veteran of the U.S. Air Force, prayed in remembrance of all veterans from the past and present. Tiffany Cox Hernandez, dean of student success, spoke about the reason the college observes Veterans Day. “Veterans Day honors all military personal who have served our great nation and gives us time to reflect upon their great bravery, their courage and personal sacrifice for this country,” Hernandez said. This college serves more than 3,000 veterans, she said. Hernandez thanked every veteran for their service. As Menéndez spoke about veteran’s service for the country, he emphasized that every veteran that serves this country is a role model. Also speaking was Col. Tom McNish, a former prisoner of war. As McNish argued that the freedom of this country is not free and must be guarded at all times. “May we never ever forget this freedom we enjoy is not free,” McNish said. “It must be defended every day, for there are those who always are out there wanting to take it away from us. The final guest speaker at the ceremony was Orlando Lopez, liberal arts sophomore and U.S. Marine Corps veteran. Lopez believes any veterans attending this college are in good hands at the Victory Center. Lopez expressed with enthusiasm over the name of the veterans center. Lopez thanked everyone at the ceremony and thanked all veterans. The ceremony came to an end as Hernandez and Menéndez thanked and shook hands as they handed out commemorative coins to the veterans in attendance. Approximately 30 veterans from the U.S. Army, Navy, Marine Corps, Air Force and Coast Guard were at the ceremony.